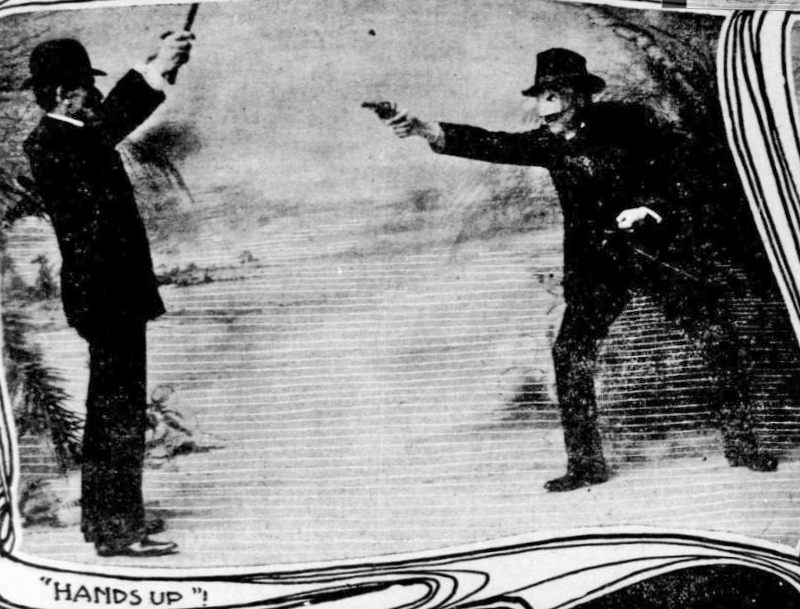 During the eighteenth, nineteenth, and early twentieth centuries, America could be a dangerous place, and knowledge of self-defense was often necessary for use in both urban and rural environments. To those ends, fencing masters and instructors often modified and applied fencing techniques to the cane or walking stick, creating their own systems of self-defense. 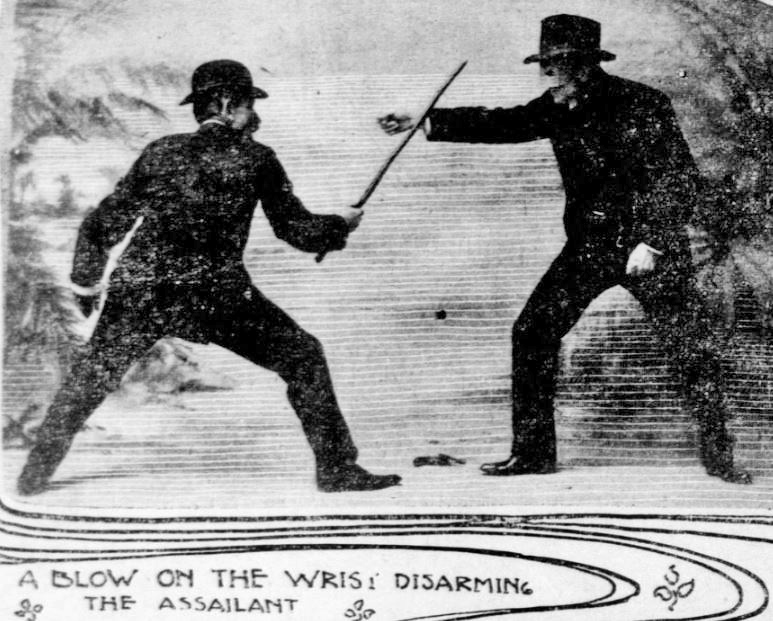 This article proposes to look at various methods of cane defense, taught by fencing masters and instructors, that were specifically intended for practical use in self-defense encounters in the everyday world. 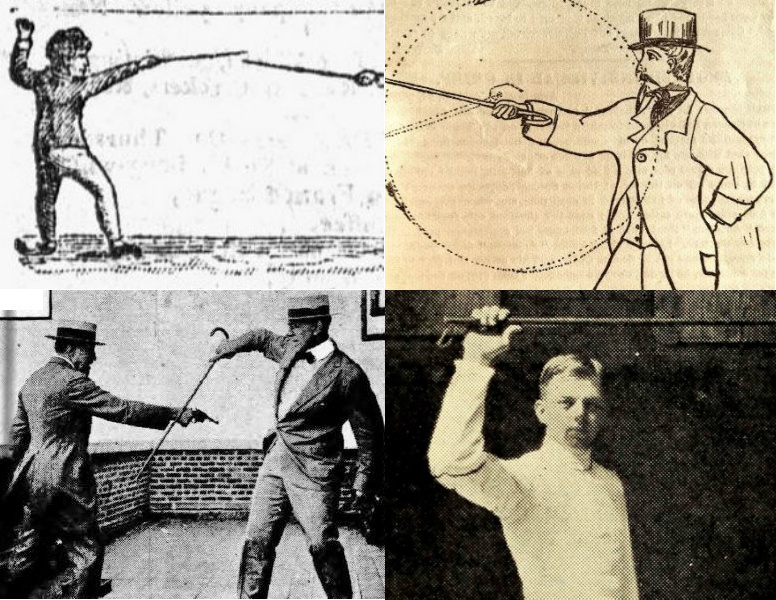 The individuals who taught such techniques hailed from a variety of backgrounds—from England, France, Italy, Ireland, Poland, Belgium, Denmark, and Germany—and specifically discussed the cane’s efficacy in defending against other potentially deadly weapons such as the sword, sword-cane, stick, dirk, Spanish knife, Bowie knife, bayonet-rifle, boarding pike, and revolver. These fencing methods were applied to canes both with and without hooks, and included techniques designed to defend against multiple attackers, variously utilizing both single and double-handed grips. In some cases, these methods of defense were influenced by one or more other formalized systems of saber, broadsword, singlestick, bayonet, French la canne, and canne royale. Although combative methods of singlestick (that is, the training weapon), la canne, canne royale, and Irish shillelagh were also used in America, and may have impacted these techniques, methods belonging explicitly to those systems are beyond the scope of this article. Moreover, they have already been written about extensively, and can be read about here and here. 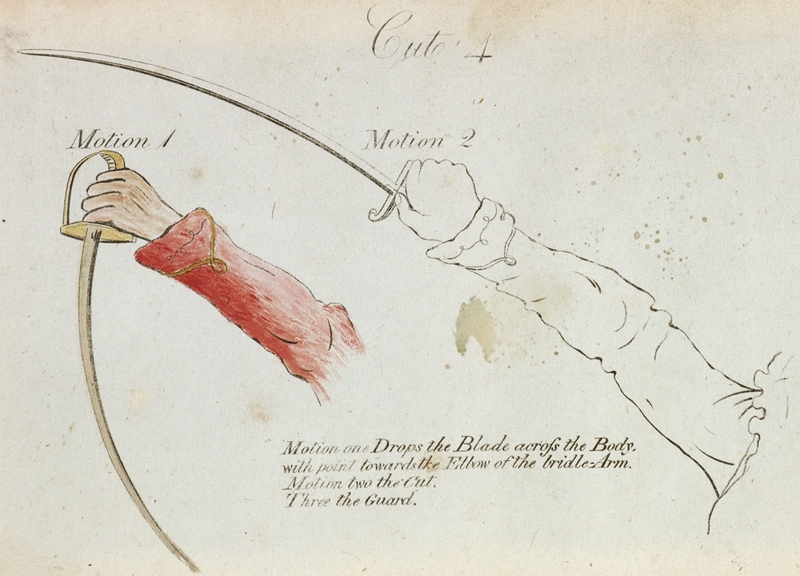 Taking such European sources into consideration, it is possible that instruction in cane self-defense was also offered in America during the middle and late eighteenth century. However, exactly what form this may have taken, or to what degree it may have existed, available evidence is not yet forthcoming. I do understand what the Broad Sword is scientifically; having learnt it of the famous [DONALD MCALPIN], a Scotch Highlander, above thirty eight years ago; and I have had the honor and pleasure of teaching it to many of the Officers of our Revolutionary Army, in Roxbury and Cambridge, in the year 1775—and have done it at times, ever since. 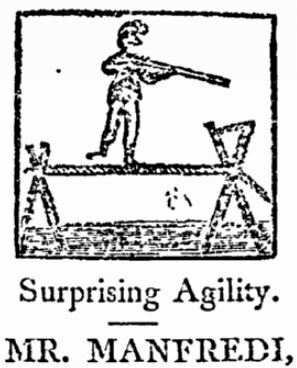 The first known mention of cane fencing instruction in America, Columbian Centinel, Oct. 27, 1798. Hewes would go on to republish a number of books on fencing and military tactics, including the 1796 saber treatise, Rules and Regulations for the Sword Exercise of the Cavalry by Major-General John Gaspard Le Marchant, which, according to the title page, Hewes had “revised and corrected.” Later in the century, Hewes’s edition did not escape the notice of fencing scholar Egerton Castle, who included it in the bibliography of his landmark Schools and Masters of Fence, from the Middle Ages to the Eighteenth Century. To cure the body the mind must be pleased by the exercise—for instance, learning the art of defence…has restored many young gentlemen in this city to health and strength. The mind being pleased with the theory, the body naturally gains strength with the practice, and when masters of the art, they may defend themselves scientifically, save their limbs and perhaps their lives by their skill. But some will say that in a government like ours, the law is our protection—in carrying a civil deportment and gentleman-like appearance we are safe enough; a great mistake in both arguments. In the first place, the law cannot protect you at the moment of attack, is expensive and troublesome, and you cannot expect to have a constable always at your heels, padding after you, like Corporal Trim after Uncle Toby. In the next place, your mild and genteel appearance, does not but invite the attack of the foot pad or ruffian; they mark you as their prey, as the hawk does the dove…therefore the art of defence is necessary, and if you come and learn, it will answer two good purposes, viz: it will cure you of bodily weakness and me–of the Mal de Pouch, if you pay me for it, as Lope Toco says to Roque. 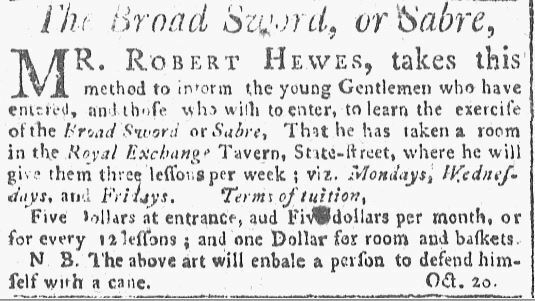 Please apply to ROBERT HEWES, Corner of Essex street, where he practices the art of Bone Setting—or at his Fencing Room, Boylston Market, where he teaches the art of Bone Breaking—genteely. 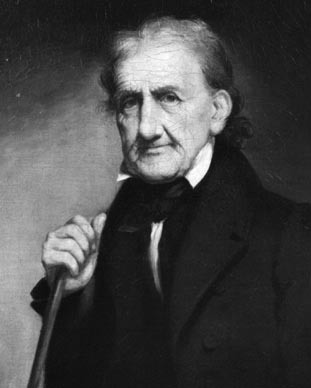 Hewes’s many business ventures seem to have paid off, for in later years he was regarded in Boston as a “gentleman of leisure,” living in a “large house, with a spacious court, and magnificent shade trees” on the corner of Essex and Washington streets. He also became known as something of an eccentric, and was often seen in his dressing-gown “playing with the peacocks and paroquets in his yard.” It was related that in 1826, he told his housekeeper, Sally, “I am 75 years old today, and I can handle a broad sword better than any young man in Boston.” Hewes passed away in 1830, and is buried next to an unmarked stone in Boston Common. In the years following the appearance of Robert Hewes, a number of other instructors in “cane defence” and “cane fighting” publicly offered their services. Seven of these individuals appear to trace their fencing lineage to a single source: the Military School of Colonel Irénée Amelot De la Croix. De La Croix was a former nobleman of Flemish, French, and German ancestry, a member of the ancien régime, and a decorated military veteran. His voluminous 1814 biography describes many of his incredible feats and adventures, noting that in the course of his career, the Colonel had impressively “been fourteen times wounded severely…and has been in fifty-six regular battles, besides near fifteen hundred affairs of out-posts and skirmishes.” (Baron de Vanden Boègard, Portrait of Colonel I.A. 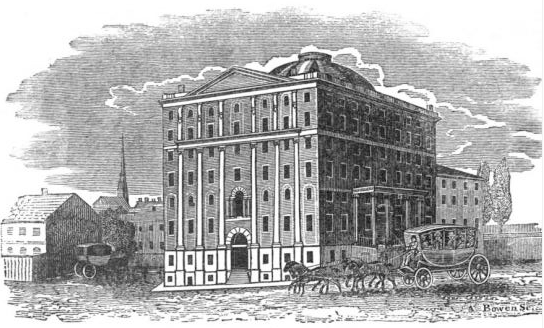 de la Croix, Baltimore: Printed by Bell & Cook, 1814). 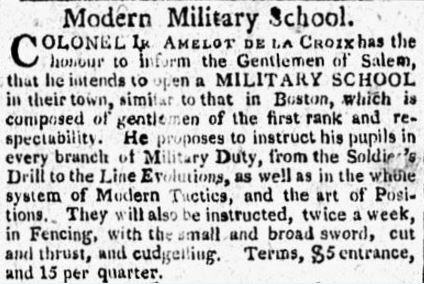 De La Croix arrived in the United States in 1806, where he “married an American lady” and opened a military school in Boston, “where he taught many.” Later De La Croix moved his school to Newburyport, then to Portsmouth, New Hampshire, and from thence to New York City and Baltimore. In New York alone he had “thirty scholars.” During his time in America, he authored several treatises on the art of warfare, and corresponded with Presidents Thomas Jefferson and James Madison. As De Le Croix’s students refer to his method as “Norman,” it may be that it was an early form of, or precursor to, French La Canne. 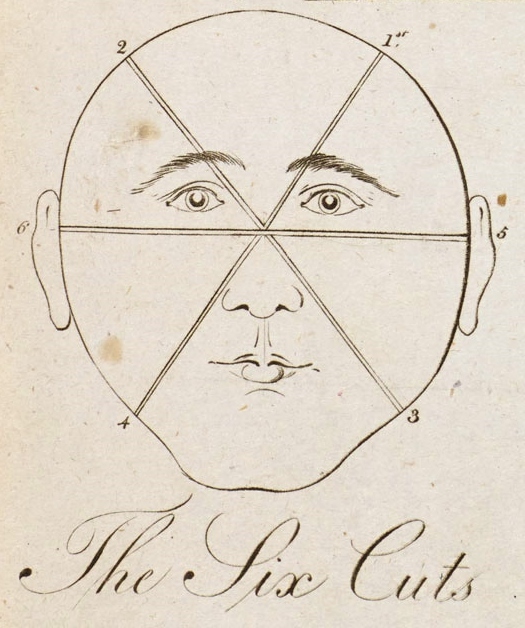 However, as the specific techniques of formal systems of La Canne were not documented until the early 1840s, it is difficult to say how much De La Croix’s method may have resembled mid-nineteenth century French systems. As noted previously, cane fencing had certainly existed in France long before this time, where it took on different forms. According to his biography, De La Croix had studied at the military schools at Chalons, Metz, and Brienne, and served in the French Marines—a fact which may give insight to future researchers. 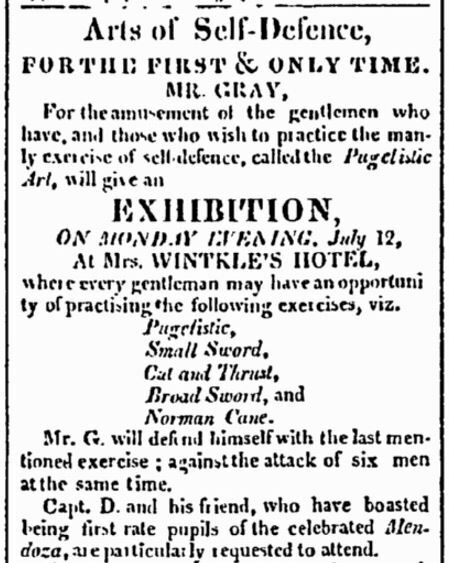 As late as 1824, Gray’s former colleague, Thomas Ryan, was teaching “Boxiana” and “the use of the cane” at his own School of Arms in Baltimore. 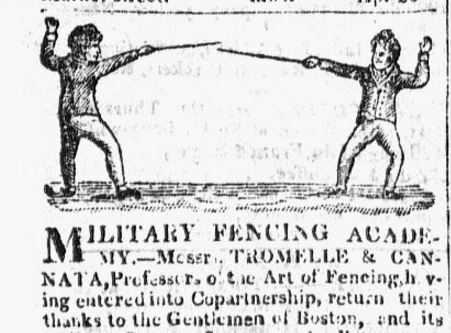 In 1818, after parting ways with fellow instructors Jean Girard and Peter Trinque, the aforementioned William Tromelle took to the Boston press to announce his “co-partnership” with a new fencing master—Antonio Cannata of Italy. Together, Tromelle and Cannata would teach defense with the “stick,” as well as “fencing, in all its various parts” for the next year at No. 3 Cornhill Square. 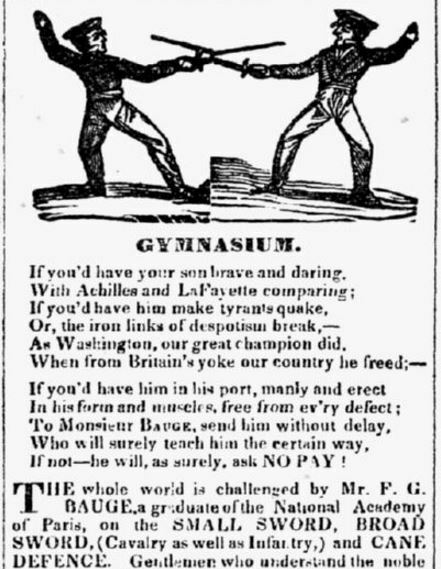 Of especial note is an advertisement published jointly by the two on April 21, 1818, in the Boston Daily Advertiser (see below). 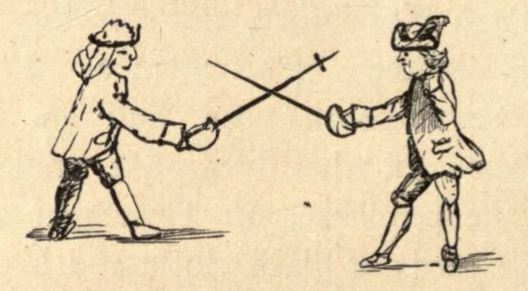 This notice contains a crude illustration, similar to those found in other American fencing advertisements of the period, except for one important difference: whereas others depict fencers engaging, or lunging, with clearly hilted foils or smallswords, the one published by Tromelle and Cannata shows two fencers facing each other out of lunge distance, with hiltless weapons—possibly sticks or canes. 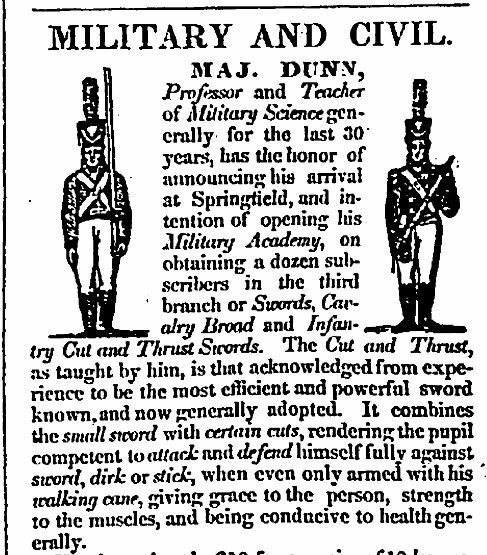 As this same advertisement listed the “Broad Sword,” “Small Sword,” “Cut and Thrust,” and “Stick” as weapons taught, this was certainly one of the possibilities. 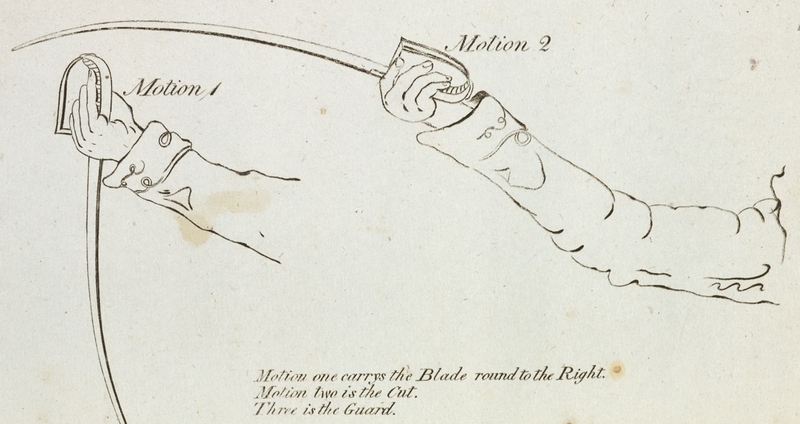 Although, given the crudeness of the illustration, it is difficult to say with certainty, this advertisement may possibly represent not only De La Croix’s method of “Norman cane,” but the earliest visual depiction of cane fencing technique published in America. Roughly one year later, in the spring of 1819, Cannata parted ways with Tromelle (possibly due to the ill-health of the latter, who would pass away in 1822), and announced the “re-opening” of his own solo school. 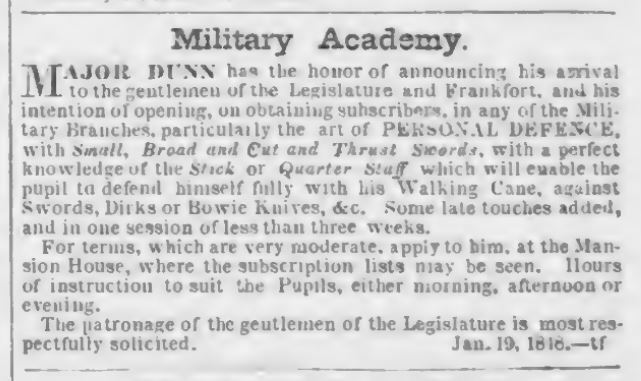 An advertisement for Cannata at this time shows a different image, of fencers lunging and parrying with hilted swords. Unfortunately Coulon’s school was not to last, as he unexpectedly passed away in November of the same year. 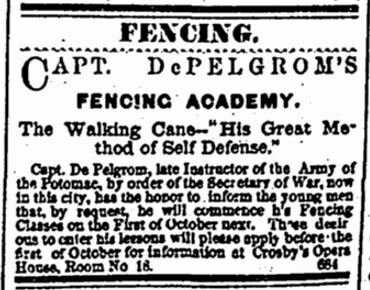 The years between 1837 and 1840 saw a number of additonal French fencing masters advertising the “use of the Cane and Stick.” The first was François George Baugé, of New York City and Charleston, and who produced at least two subsequent cane fencing instructors, Charton and Chabriel, all originally “of the Royal Academy of Paris.” Although Baugé published a series of illustrations on the art of fencing, these did not, unfortunately, include the cane. Other French instructors of “cane defence” during this same period was H. Hautonville, who appeared in Charleston in 1840, and E. Raux, who ran an “Academy of Arms” in Richmond, Virginia, in 1849 . These individuals all neglected to describe their methods of cane defense, and may very well have been teaching French La Canne, the technique of which would begin to be documented in France during the 1840s. At the same period, a few instructors hailing from other nations appeared, who deserve mention. 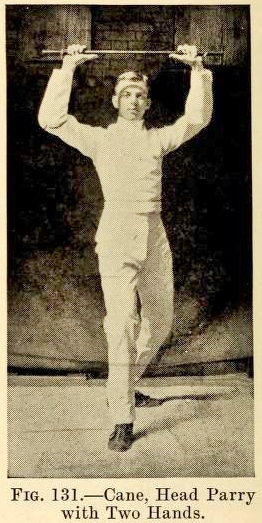 Another colorful character worthy of mention, and who hailed from Italy, is “Signior Manfredi,” described as an “Artist of Agility,” and “astonishing man who has lately arrived in this country from Saddlers Wells,” who performed feats of strength and balance, as well as demonstrations of cane defense. 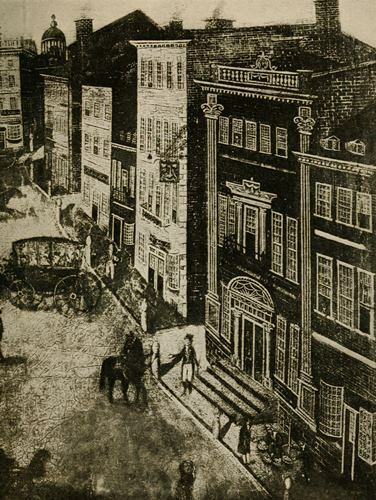 Signor MANFREDI has indeed already performed feats calculated both to “surprise and astonish.” The manner in which he went through his exhibitions on Monday evening was in the highest degree satisfactory to the audience, who testified their opinions by repeated and long-continued shouts of applause. He is so evidently a master of his business, and with such entire ease and dexterity does he requit himself, that the spectator may view his feats without having his sensations of pleasurable emotion disturbed by apprehensions for his safety. Curiously, in one Maryland advertisement, Manfredi’s stick is described as “Dutch” rather than Italian. Most of Manfredi’s notices mention the use of the stick against multiple opponents—a feature which echoes the advertisements of De La Croix’s many students. As Debar passed [Morton] jumped out at him and endeavoured to stab him with a Bowie knife; DeBar’s alertness and skill at fencing saved his life. He knocked off the blow with his cane, and then grappled Morton until a policeman came. A rencontre took place at the Prentiss House, between Major Dunn, well known in this City as a teacher of the art of boxing, fencing, cudgel playing, &c. and Major Anderson Miller with Canes. Dunn it seems wielded his stick “most scientifically.” The parties afterwards met and fired at each other with pistols, but without effect. The position of the [fencers] will be fronting each other, and placed about four full paces apart, the right foot will be advanced about half a pace, the point of the toe, sword-arm, and right side only, presented to each other, the left hand on the hip, arm a-kimbo, swords crossing each other, in a diagonal position, taking care to keep the sword-hand on the right eye as much as possible, which is the general guard; the cuts will be made with a stiff arm, using the wrist instead of the elbow… When the opponent is a strong and vigorous man, and assaults with rapidity, act on the defensive, retreating a little if too hard pressed; but on discovering that he begins to slacken or get fatigued, then will be the proper time to become the assailant with advantage. To prove the cane’s efficacy as a personal sidearm, Monstery includes a thrilling anecdote regarding an incident when he was attacked by three knife-wielding members of the Spanish secret service, who were intent on assassinating him. Using only his hickory cane, Monstery was able to successfully defend himself, until his attackers eventually fled into the night. Monstery also eschews the use of single-handed thrusts, which, he states, are “easily parried,” expose the fencer, and can only hurt or disable an opponent in two spots. Although Monstery notes that the case is different with two-handed thrusts, he reserves these techniques for his subsequent chapters on the use of the quarterstaff. Throughout his life in America, in addition to his New York City academy, Monstery also ran schools in Baltimore, Oakland, San Francisco, and, in his final years, Chicago. Bonnafous’s article, as far as we currently, know, is the last to treat of cane defense during the nineteenth century. The simple blow on the wrist is as effective as any blow can be. A right swing of the body and a quick, strong blow across the wrist with the cane causes the footpad’s hand to instantly relinquish the weapon and leaves an opening for an attack with the advantage in favor of the peaceful homegoing citizen. However, he is not quite ready for the homegoing yet. He prefers to see his footpad eating humble pie first. Professor Tronchet has many more swings and thrusts and tilts of the simple walking cane wherewith to bring the footpad to confusion, but the more difficult ones would require much practice and a close perusal of the rules set down in some pamphlet on fencing…as steady nerve, a cool head, and a quick action are the three requisites–given the walking cane and the ability to use it properly. 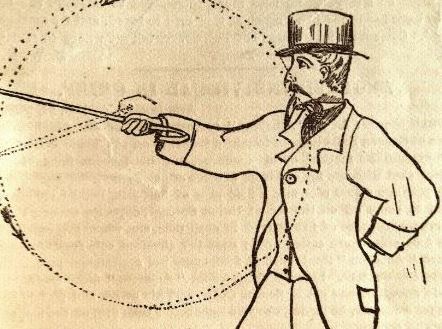 Should the cane become a popular weapon of defense against footpads, and according to Professor Tronchet, there is no reason why it should not, it will be necessary for the footpad who wishes to be successful in his chosen profession to take the art of fencing. Otherwise he will find it pleasanter to earn his own living than to depend upon others to earn it for him. 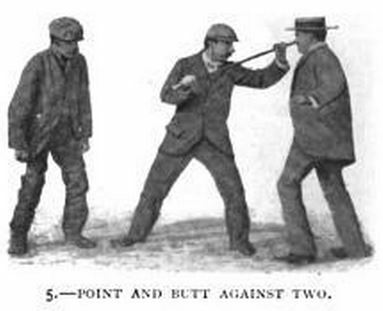 Bartitsu was an English hybrid martial art developed by Edward William Barton-Wright, and which was practiced in Great Britain between the years 1898 and 1902. 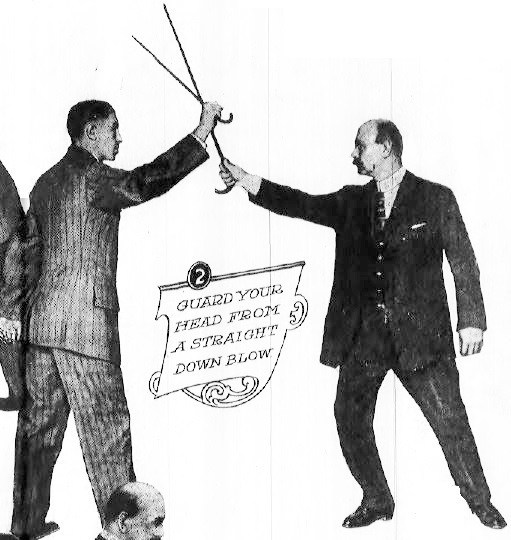 Although relatively short-lived, the techniques of Bartitsu were documented extensively in various journals and magazines, which saw widespread distribution. 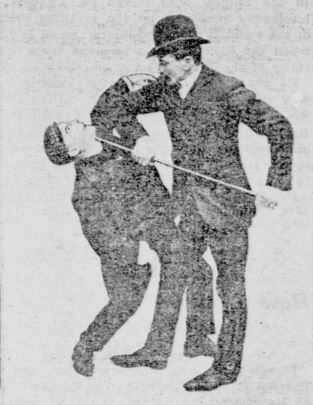 Although much of Bartitsu’s unarmed techniques (particularly grappling) were borrowed from Japanese martial arts, its method of cane self-defense was largely influenced by a style of la canne developed by the Swiss maitre d’armes Pierre Vigny. When a man is called on to face a ruffian, he needs no better weapon than a hickory walking stick. A revolver is likely to harm him more than to help. As soon as a man reaches for his weapon, his adversary has the right to shoot, and the accomplished criminal is almost sure to have his weapon ready first. The stick is the better weapon, because it is quicker. It is in one’s hand already. 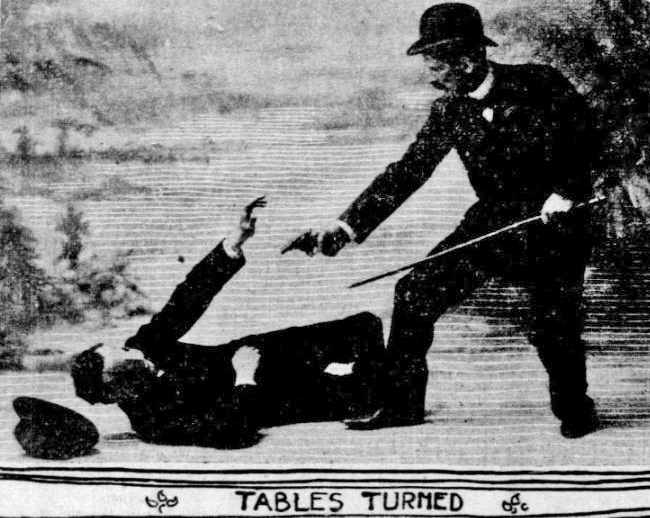 It is always “loaded”…Should a New-Yorker combine both the tactics of the London stick man and the United States naval wrestler, it is safe to say that the police of this city would have far fewer holdups and burglaries to record than at the present time. 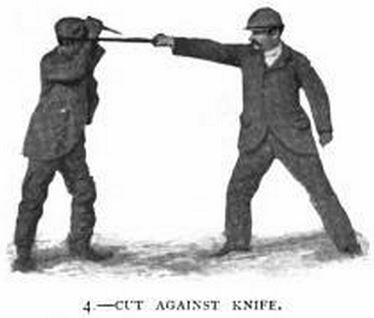 The article also offers an interesting look at the perceived fighting styles of various local “thugs” of Anglo-Saxon, Spanish, Italian, and German origin, and offers advice for defending oneself against assaults with the fist, foot, stick, knife, and gun. 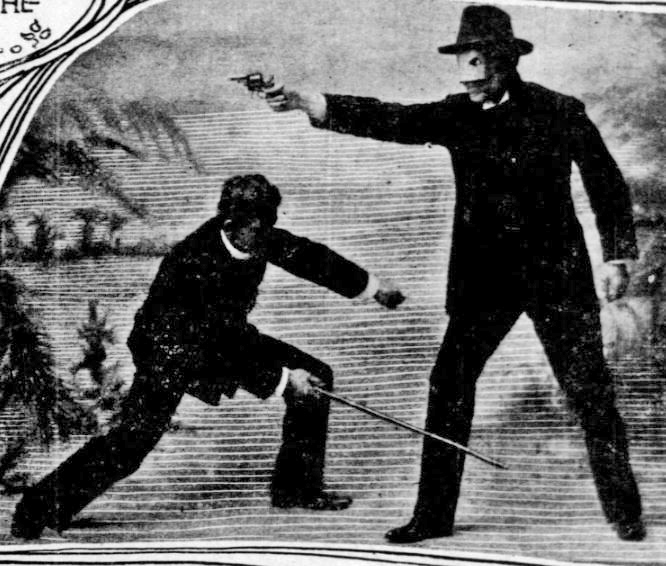 In 1911, another instructional article on self-defense with the cane appeared in the pages of the Chicago Tribune. The author, writing under the name of “The Marquis of Queensberry,” was none other than Lord Percy Sholto Douglas (1868-1920), 10th Marquess of Queensberry, and the second son of John Sholto Douglas, the Scottish nobleman best known for lending his name and patronage to the “Marquess of Queensberry Rules” that formed the basis of modern boxing. 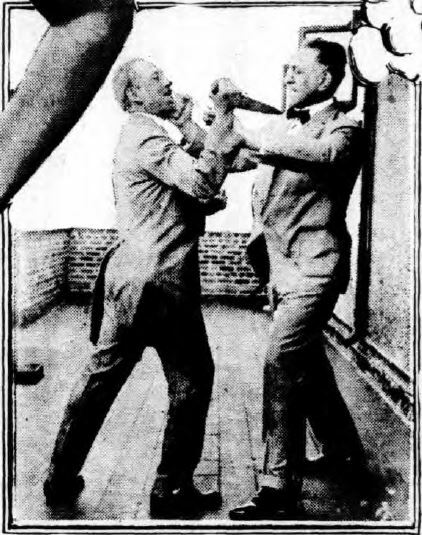 Most of Douglas’s previous columns pertained to boxing and jiu-jitsu; he did, however, include one on self-defense with the cane, and another on the use of the umbrella or parasol (intended for women), both of which were accompanied by a number of photographs, some of which included Douglas himself, and drawings. 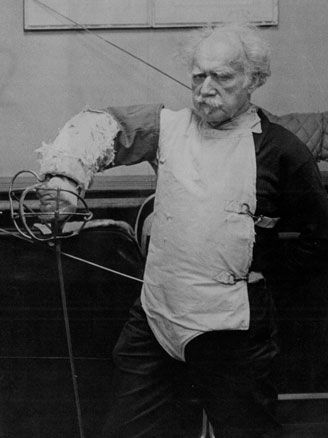 Like the methods of Hewes and Monstery, as well as the cane techniques set down by fellow Briton R. G. Allanson-Winn, 5th Baron of Headley, Douglas grounded his cane defense firmly on the fencing techniques normally applied to the broadsword and saber. Douglas’s articles are highly interesting, and probably most useful in their simplicity. They are intended for a general audience, as well as for fencers looking to apply their preexisting knowledge of the sword to common household articles such as the cane and umbrella. 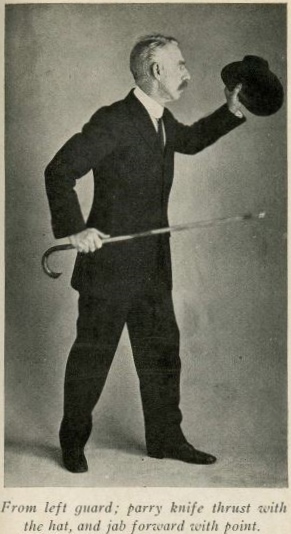 From a pedagogical standpoint, Douglas’s series is perhaps also notable for its inclusion of footwork diagrams in its section on the umbrella. 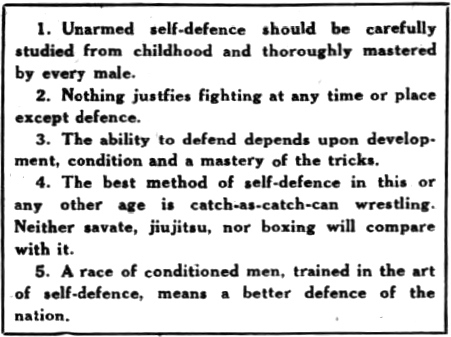 In 1912, another treatise on cane self-defense appeared, published in the form of a short pamphlet by Andrew Chase Cunningham of the United States Navy. Much has already been written about this text, which is also widely available. Suffice it to say that Cunningham was president of the Washington D.C. Fencing Organization, and the author of a fencing text, Sabre and Bayonet (1906). According to this article by Maxime Chouinard, Cunningham had been a student of the elder instructor Antoine J. Corbesier, who had served in the Belgian and French militaries before immigrating to America, where he became instructor at the U.S. Naval Academy in Annapolis, Maryland. According to Chouinard, Cunningham’s cane defense techniques bear some resemblances to Corbersier’s method of Belgian Canne Royale. Cunningham’s The Cane as a Weapon contains eighteen pages of text, as well as twelve photographs. In 1915, bodybuilder and physical culturalist Dr. Benjamin Franklin Roller, M.D., published a series of articles on exercise, diet, healthy living, and self-defense in the New York press. Roller propounded a unique unarmed method of self-defense, which combined savate, boxing, Cornish wrestling, and American catch wrestling (this last being Roller’s specialty) for use against unarmed assailants, as well as those wielding a knife or gun. Eight things should every boy be able to do (until he can do every one of them fairly well he is not a man complete)—to run, to jump, to ride, to shoot, to wrestle, to box, to swim and to fence. You don’t have to be an expert in all, or even in any one. These are the fundamental studies of self-defence, and the more you can learn about all of them the more you will increase in ability which some time you may badly need. Fencing is one of the most beneficial of exercises, great fun and a very effective means of defence. Get the singlesticks, with mask and glove, at any sporting goods house, or you can practise the movement with any old stick. I never took a lesson in this work in my life, but I became so efficient in singlestick fencing that I defeated the best professional fencer on the Pacific coast and twice saved my life by knocking a gun or a knife out of an assailant’s hand by means of an ordinary cane. 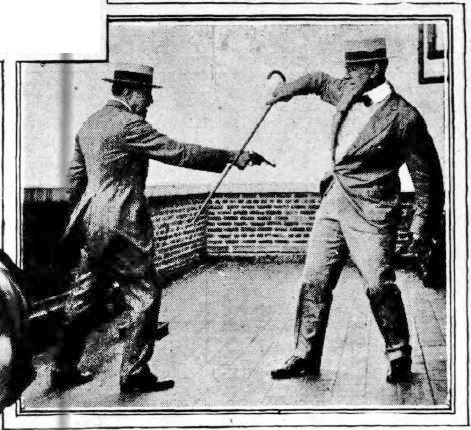 Roller (on right) demonstrating self-defense with a cane. 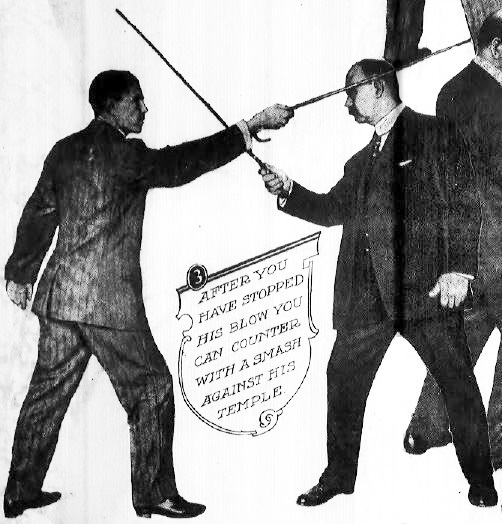 In 1920, another treatise was published containing self-defense techniques applied to the cane. The author was George Heintz, Junior, an instructor at the United States Naval Academy, who included his method in the Naval Academy’s Manual of Athletic Requirements. A number of sources indicate that Heintz had learned fencing from his father, George Heintz, Sr., a German immigrant who had also taught fencing at Annapolis, Maryland, and was well-known in German fencing circles and Turner societies. 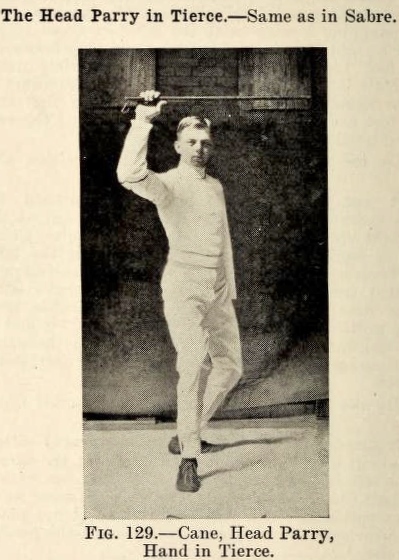 His son, George Heintz Jr., was a national saber champion in 1890, and was appointed Assistant Swordmaster at the Naval Academy in 1903, taking over as Head Swordmaster from his father in 1915. 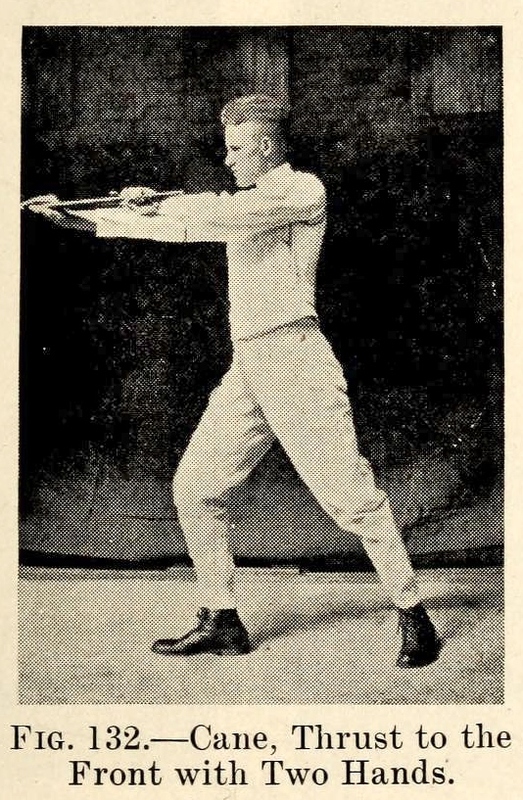 George Heintz Jr. continued to serve as “Swordmaster” and head instructor at the Naval Academy until 1932. About this same period, another fencing master, of French origin, also began offering cane instruction in the northeastern United States. Born in France, in 1893, Marcel Cabijos served in the French Navy throughout World War I. He was a combat instructor and served in the Fusiliers Marins, a combat unit that was deployed to the land from ships. 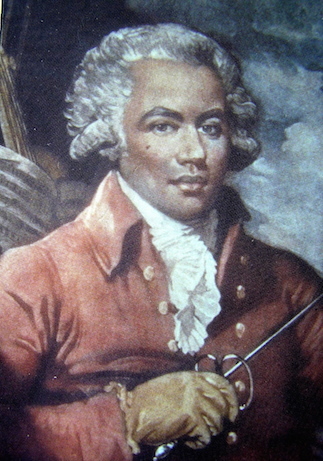 During his enlistment he founded a fencing society aboard his ship, and became the fencing champion of the French navy. After the war, he received his Maître d’Armes (master of arms) diploma and taught in the south of France for several years before emigrating to New York City in 1924. In addition to his rank as a fencing master, Cabijos was also an instructor in judo and savate. 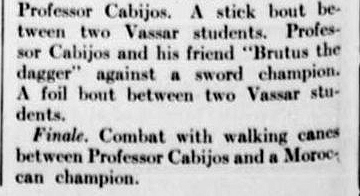 In 1926, Cabijos attained great renown by defeating the sabre and épée champion of the United States, Leo Nunes, with only a twelve-inch dagger against Nunes’s dueling sword. Unfortunately, as far as anyone knows, Cabijos never wrote any treatises or articles about his method of cane self defense. However, additional accounts of Cabijos and his fencing exhibitions can be accessed in the following collection on Pinterest. 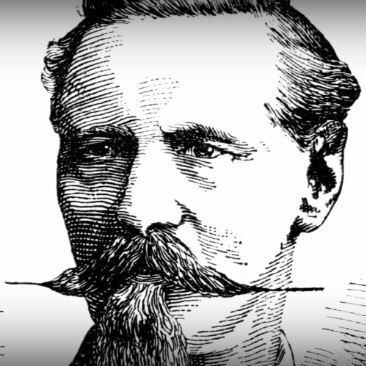 The history of cane self-defense in America would not be complete without mentioning Frederick Rohdes, a German fencing master who taught the art and science of fencing in New York City in the old tradition. Maître d’Armes Frederick Rohdes, pictured with a schlaeger, one of the weapons taught at his academy, during the late 1970s. 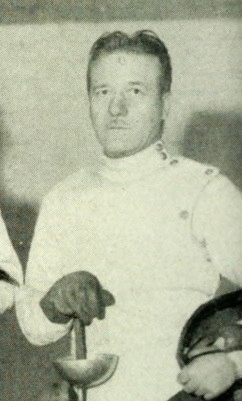 Born in 1897 in Western Prussia, Rohdes taught fencing as an assistant instructor on the American west coast for some time during the 1920s before moving to New York City. 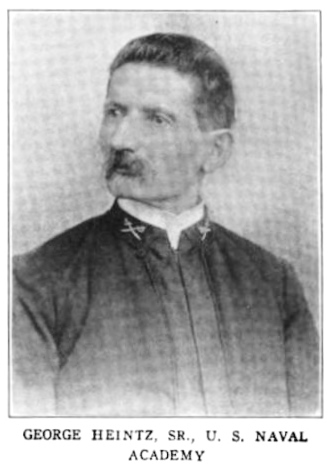 He trained under several notable fencing masters, among them Maestri Luigi Barbasetti and Aurelio Greco eventually becoming Provost and Master under Marcel Cabijos (see above). Maître Rohdes opened his own fencing academy in 1948, which was located above the Loew’s Orpheum building on 169 East 86th Street in New York City. In conclusion, it is important to note that the numerous fencing instructors and schools mentioned throughout this article do not, in all likelihood, represent a complete picture of what existed in America during the periods covered. It is highly probable that many instructors never advertised their services, and that there existed additional masters and instructors in America during these times who have escaped the eye of history altogether. It must be understood, therefore, that the corpus of surviving records represents a window through which one can glimpse only a part of the historical reality. It is to be hoped that, in the future, other researchers will uncover additional evidence of schools and masters of cane fencing in America. Text of this article, except where quoted, © 2016 by Ben Miller. « Manly Exercises. The Broadsword and Single-Stick.